Iron Maiden's Book Of Souls tour artwork to celebrate their homecoming to Sheffield Arena on Wednesday, May 10, 2017. Rock superstars Iron Maiden are celebrating their Yorkshire homecoming with this unique tour artwork which really does raise the roof at Sheffield Arena. It features their giant zombie mascot - Eddie the Head - smashing through the building, tearing out its beating heart in one hand while pulling away part of the building in the other. And as heavy metal fans of the band cheer with crazy excitement outside, one man strikes a pose from Sheffield movie classic The Fully Monty while a brass band play in reference to South Yorkshire film Brassed Off. Iron Maiden front man Bruce Dickinson was born in Worksop and spent the early years of his life in Sheffield - he began his career in music fronting pub bands in the 1970s while attending school in the city. Dave Shack, the band's co-manager, is also a Yorkshireman and started out writing music reviews for The Yorkshire Post. The artwork - to advertise their Book Of Souls tour gig at the venue on Wednesday, May 10 - has been created by longstanding Maiden artist Herve Monjeaud. Over the years he has produced unique designs for Maiden events right around the globe, from Australia to Brazil and now from Scandinavia to Sheffield. His latest work will be used in advertisements to feature in titles including The Star and The Yorkshire Post from Thursday. Eddie the Head, a perennial fixture of the group's artwork, appears in all of their album covers, as well as most of their singles and in their merchandise, which includes T-shirts, posters and action figures. On top of this, Eddie features in all of the band's concerts, as well as in the first-person shooter video game, Ed Hunter, and the role-playing game, Iron Maiden: Legacy of the Beast. There is no indication it will be used as a poster or T-shirt but with fans around the globe eager to snap up rare collectables that could yet happen. It was created by longstanding Maiden artist Herve Monjeaud who over the years has created unique designs for Maiden events right around the globe, from Australia to Brazil and now from Scandinavia to Sheffield. “For a band that predominantly hail from London, coming up with this art for our fans in the city of steel was a nod to the support we have all around the country for this first full UK tour since 2011 and a way of recognising Bruce as someone shaped by his formative years in the city," said co-Manager, Dave Shack. Iron Maiden continue their hugely successful The Book of Souls World Tour into 2017 with a series of European arena shows stopping off in England for eight dates including a Sheffield Arena with no further European cities will be added to this schedule for 2017. BUY TICKETS: Tickets to see Iron Maiden at Sheffield Arena are £51.52, £55.44 & £64.40, including booking fees. 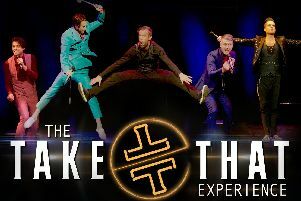 Buy in person from the Box Office, call 0114 2 56 5656 or visit www.sheffieldarena.co.uk.